(Seychelles News Agency) - All voting stations across Seychelles' three main inhabited islands, Mahe, Praslin and La Digue closed their doors as planned at 7 p.m. local time, with no one waiting in line to cast their ballots after 12 hours of voting in the run-off to elect a new president. This is a major improvement compared to the first round of voting, where most polling stations across the three islands had long queues with people coming to vote at the last minute before closing time. At the School Meal Centre, serving as the polling station for the central district of English River on Mahe, the last voter came to cast his vote 5 minutes before closing time. The electoral officer in charge of the polling station, Michel Mellie told SNA that two main factors had contributed to a smoother and much faster electoral process this time round. "Today we started to call out the names of people who had already voted beforehand at around 5.45 a.m. and we finished at 6.35 a.m. so we had ample time to get ready. Secondly, the new approach not to call out the national identification numbers speeded up the process," said Mellie. "We recorded more people who came to vote in the run-off compared to the first round…about 3 percent more…2,504 voters voted in the first round compared to 2,584 people in the second round." Mellie noted that everything went well aside of four people who could not vote at English River because their names did not appear on the list and not even on the master register. He also noted that at least 70 people will have to do the necessary to change their surnames because of divorce or marriage on the register or will have to go and register in the districts where they are currently residing once the voters registration process resumes . A total of 2,886 people were eligible to vote in the English River district and 86.8 percent did so in the second round of voting. Now that all stations have closed on time, vote counting have begun as early as 7.30 p.m. at some polling stations and the final results are expected later this evening. Of Seychelles 93,000 people, a total of 70,943 were eligible to vote. According to figures made available to the media, by 7 p.m. this evening the official closing time of all polling stations, a total of 61, 553 had cast their ballots. This puts the level of participation at 86.8 percent which is 0.6 percent lower than the participation of voters in the first round two weeks ago, when 62, 004 people voted. The highest turnout was at Les Mamelles, a district on the eastern coast of Mahé where 96.5 percent of the district’s 2,408 voters turned up. 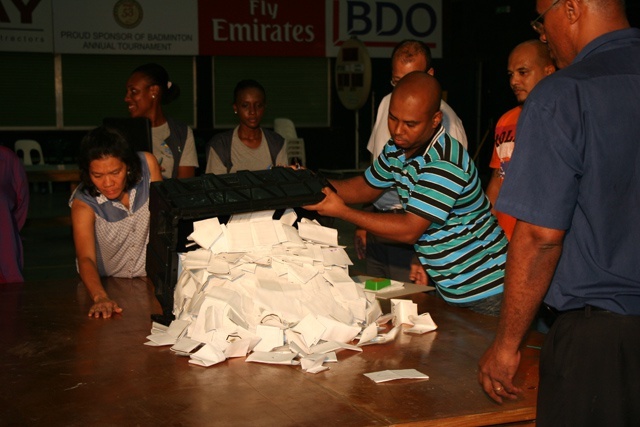 Inner island where incumbent president James Michel recorded the highest percentage of votes in the first round, 68.40 percent, recorded the lowest turnout of 76 percent as 1,511 out of 1,989 registered voters turned up. Michel is facing the Seychelles National Party leader, Wavel Ramkalawan, in the run-off as the two obtained the most votes in the first round, which saw none of the six candidates win an outright majority of 50 percent plus one vote. Michel managed to win 47.76 percent and Ramkalawan 35.33 of the votes. Three of the other candidates who contested the first round were backing Ramkalawan in the run-off.